Anthony Martial is ‘edging closer’ to signing a new contract with Manchester United, according to the BBC’s Simon Stone. French media outlet RMC reported on Friday that Martial has agreed on a new five year deal at Old Trafford, with only a few minor details left to clarify. The Frenchman looked certain to leave in the summer having fallen out of favour and form under Jose Mourinho, who was open to selling him over the transfer window. But according to Stone, with Martial starting every week once again and Mourinho now out of the picture, talks with Man United have resumed and the chances of a new contract are much higher than two months ago. 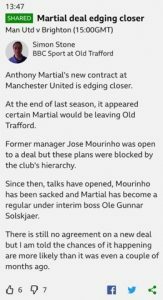 That Mourinho was genuinely willing to let Martial leave is a crime against football and indeed logic itself. Even with the 55-year-old’s poisonous attitude infecting every sinew of United’s bodily structure, Martial was there, scoring goals and humiliating defenders, his raw scintillating talent shining through like a jewel among rocks of coal. He brings bums off seats and roars of amazement in a way no other United player does. He makes supporters lavish over his ability to the point where Martial FC is genuinely bigger than Manchester City. He scores beautiful goals. He burns past defenders at will. He is a gorgeous man. He is still so young. And he is, most definitely, born to play for United.